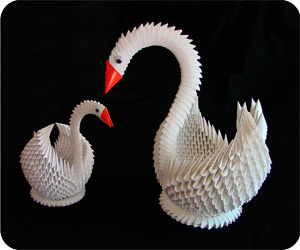 The 3D Origami Swan is one of the most exquisite 3D origami models which you can make. 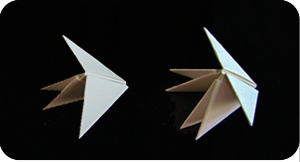 Despite the fact that you can make almost anything with enough triangular units, the swan remains a favorite. 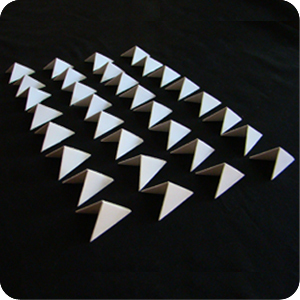 To start, make about 500 to 600 triangular units as shown here. Place them in a box or bowl. 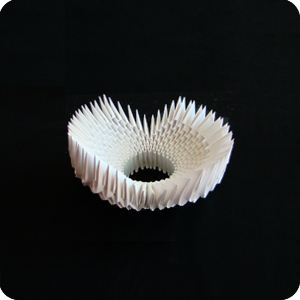 Don’t worry about the quantity, just start folding and after a day or two, you will have accumulated enough pieces to start assembling them into a swan. 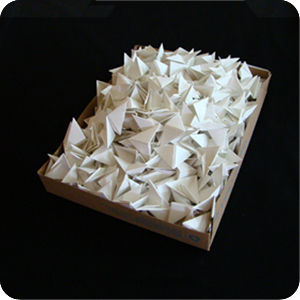 Remove 30 to 32 units from the pile of already-made triangular units. These will be for row-1. 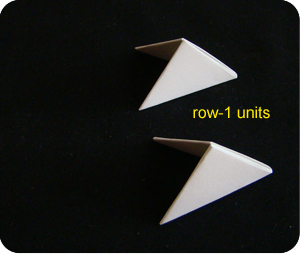 If you have bought a kit to make the swan, check here for the exact number of units to use in each row. 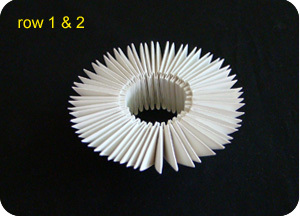 Place two of the row-1 units side by side. Bring another unit from the pile of already made units. This 3rd unit will be for row-2. Insert the two row-1 units into the row-2 unit. 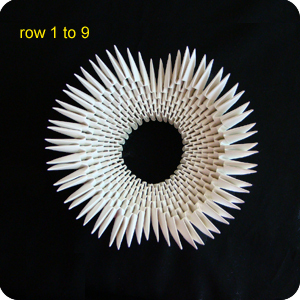 Bring one row-1-unit (from the group of 32 units) and one unit from the pile. 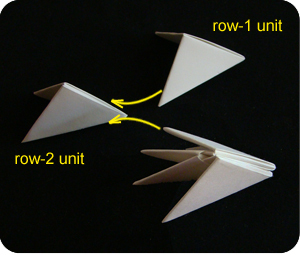 Continue to use row-2-units to connect the row-1-units together. 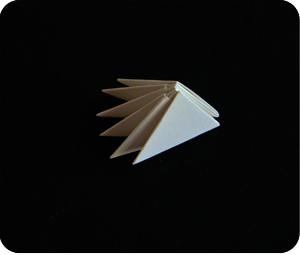 Note that the units may look more like this: the end flaps tend to flare open. Continue adding the row-1 units. 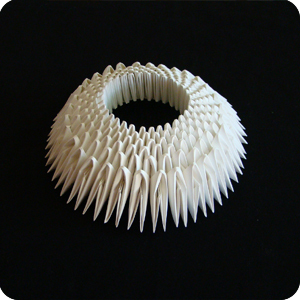 After a while, the structure will start to curve around. 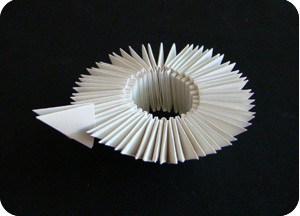 When you have connected the 32 row-1 units, use one more unit from the pile to connect the structure into a ring. 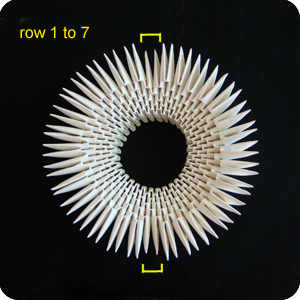 Last image shows how it looks like when row-1 and row-2 are complete. Once row-2 is complete, add more units (from the pile) to make row 3.
you have gone around. When adding units, be sure to insert the tabs from two different units into the pockets (slots) of one new unit. Staggering the units in this manner (like layering bricks) makes the final model more stable. Image on the left is incorrect because the new unit is added to one existing unit. Image on the right is correct because the new unit straddles two existing units. 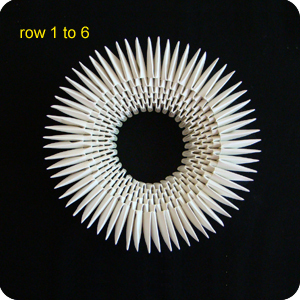 Continue in this manner for rows 4 through 6, adding 32 units in each row. 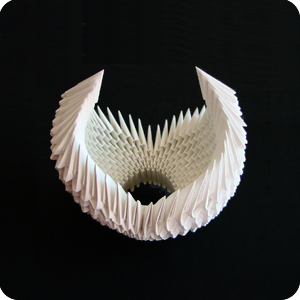 This is how swan’s body looks when the structure is inverted. Assemble row-7 as usual except, remove two units. Shown here, the units at “12 o’clock” and “6 o’clock” have been removed. 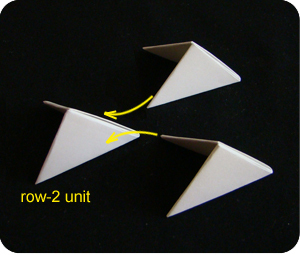 Row-7 uses 30 units instead of 32. Continue adding units for the subsequent rows. In each row, remove two units so there are fewer and fewer units per row. At the end, only one unit is needed to complete the row. 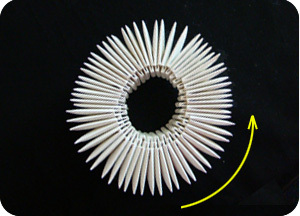 The swan’s neck, tail, and base are made in a slightly different way. 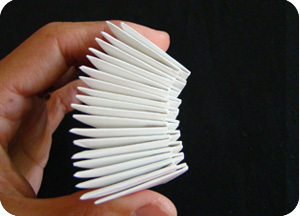 The units are inserted in a stacked manner (not staggered). 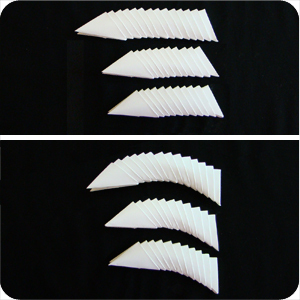 Both tabs of one unit are inserted into the pockets of one unit. 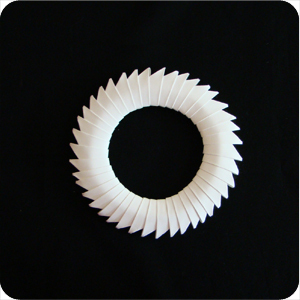 This gives a linear stack of units which can then be bent to give its desired shape. 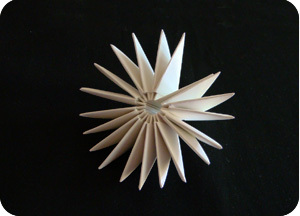 is made by using 45 units. 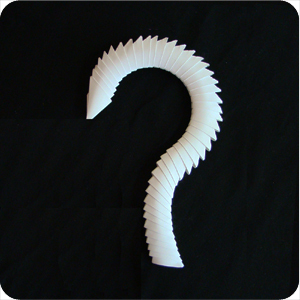 After the units are inserted into one another, bend it into a S shape or a ? shape. 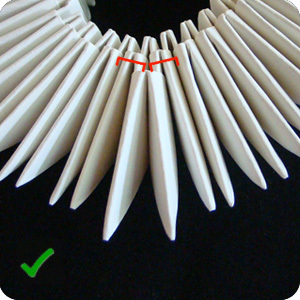 The neck piece is the most fragile and glue may be needed to help keep it in its desired shape. 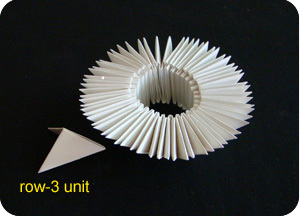 are made by using 14 units (one of these) or 11 units (two of these). 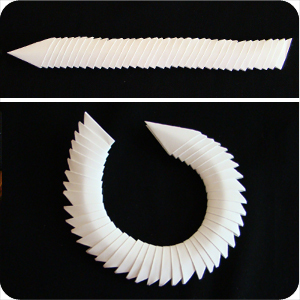 After the units are inserted into one another, bend them so they are curved. 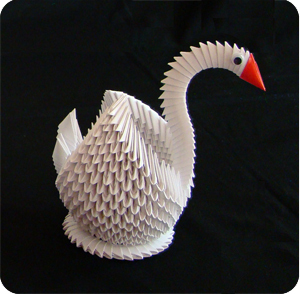 which the swan sits upon is made of 40 units. 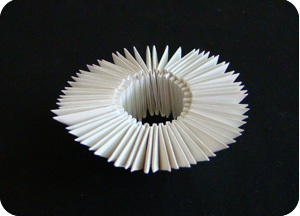 Insert them, then bend the units into an O shape. 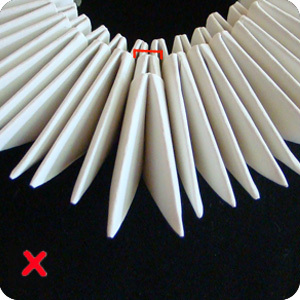 Assemble the swan by inserting the neck piece into the one missing unit at row 7. 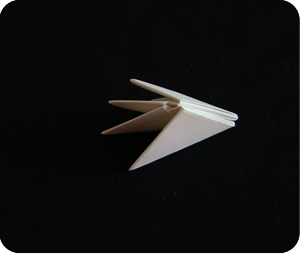 Insert the tail feathers at the opposite side of the swan’s body. 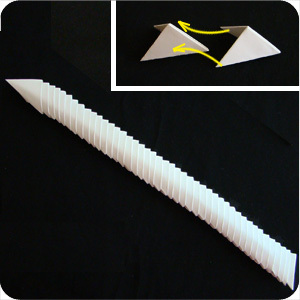 Glue is not needed for the body of the swan because the staggered assembly makes it secure. The neck, tail, and base may need a dab of glue.